Photography forms an inherent part of producing artwork because it offers a snapshot of reality. Perfect photographs are not always necessary but useful visual information that can be applied to painting. Having some mastery of photography will help the artist get the effect desired. Having a great idea for painting will often involve using photographs at some point. But the key to taking pictures that can be used in art lie in being in control of what is visible through the viewfinder before taking the shot. This means practicing visual awareness. It is a given that sharp photos are essential when using them to reproduce detail and this means spot-on focusing and minimal camera-shake. Making sure no part of the object is cut off is also important. This means having some understanding of how the camera works. 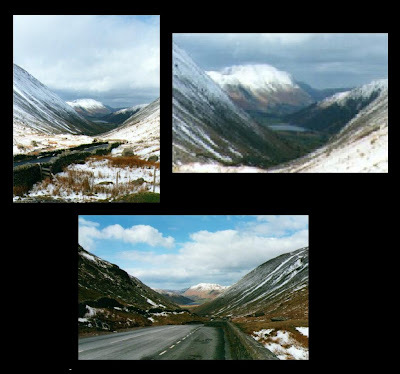 These three photos of Brotherswater in the Lakes (UK) feature high tonal contrasts, ideal for impasto techniques, but no good for a detailed study, for if we pan in (top right) the image becomes pixilated. Notice how the same location looks different when shot in landscape or portrait mode, and in different weather conditions. In order to improve visual awareness in photography, find a selection of photos or cuttings from magazines and then make an evaluation of each. This exercise is also suitable for an art class in photography or art. 1 What is the focal point of the photo? It might be an ornament, a cliff-face or castle. 2 Are there any secondary focal points within the photo? What are they? Examples might be a speeding boat in the distance, an oak tree or a chimney stack. 3 Make an educated guess of whether any of these focal points are intended or accidental. Give reasons for believing either. It doesn’t matter if you know the answer or not; make a calculated estimate. The boat, for example might appear to have come into view at that particular moment, or a dead tree in the background might have been included to echo another tree in the foreground. 4 Make a note of what lies at the edges of the photograph and what lies in the centre. Does the composition appear one-sided; does it appear balanced to the eye? What can be seen in each of the 4 quadrants of the photo? What Makes a Good Photograph for Painting? Now make a judgment of the photo’s weakest points. What didn’t work? This might be a pylon that appears to sprout from behind a person’s head or too much background behind the object. There might be insufficient visual information due to a blurred photo. State what doesn’t work in the photograph and say why. Suggest how this problem can be overcome if the shot was taken again. What are the most prevalent colors in the shot? Which colors occur least frequently? What are the brightest colors? What are the palest tones on the shot? What are the darkest tones? Which tonal or color area draws the eye. Why? Is the photograph monochromatic or contains mostly bright colors? And lastly, if you were asked to do a painting working from the photo, which colors would you use? To make this task more manageable, break it down into each area. Make a visual estimate of the pigments you would mix if you had to reproduce the subject matter depicted. This might be burnt sienna and cadmium red to emulate a brick wall or viridian green and burnt umber to render a spider plant. Think about the art techniques you might use. Would a detailed approach fit if the photo depicted a butterfly? Would a more suggestive expression be use for a sky? Would wet into wet be used or dry brushing? Could scratching into the paint layer be employed to create patterns or textured effects? What are the challenges ahead? For instance, intricate patterns on a lattice fence might require a lot of work. Does the sky lack detail because it is overexposed in the photograph? You may repeat this process when evaluating each photo. Doing so will help make you more aware of what can be seen in each photo and anticipate challenges that lie ahead before taking a shot. Good lighting is also vital if a photograph is to be of any use for artistic expression. A dull day or indoor lighting could rob the shot of interesting tonal contrasts. The shot could appear bleached-out under a flashbulb or pixilated under poor dull light. A bright day will increase the vitality of a shot, creating interesting reflections such as light bouncing from neighboring surfaces. What would appear to be an ideal photo for a painting may turn out useless as an art resource. Often, a series of shots will be needed to create a painting. High visual awareness of what lies within the viewfinder will help the photographer gain the results needed. Awareness of what lies in the background as well as the foreground will help reduce the chances of a disappointing shot that cannot be used. Anticipate artistic challenges such as high detail, a pixilated shot or bright colors. What art techniques would you use when depicting the subject matter in a painting? What pigments would you use and how would you overcome foreseeable problems? Conscious evaluation of photographs will help improve photographic techniques, particularly when it comes to using them for creating artwork.